The good: So.. how I do review this book without actually telling you anything about it? Because really, going in blind will make the the twists and reveals all the more jaw-dropping. But if you need some information, here's what you're allowed to know. There are two realities. In the first, time travel is possible but a girl named Em is determined to prevent the creation of a time machine because it will save the world and save her from the cruel doctor torturing her. In the other, there's Marina and James - two childhood best friends potentially about to become more. Marina is your popular girl-next-door who has been in love with him forever and James is a shy, science prodigy whose life is about to change drastically. And somehow all their stories are interconnected. All the main characters are so intriguing and complex. No one is what they seem, nothing is black and white. Everyone is carrying some sort of baggage with them. But these things don't make the characters unlikable. I think this very easily could've happened but instead, the author did a great job of giving us real people faced with difficult choices. People you could feel for and struggle to understand. We see the story unfolding mainly through Em and Marina's eyes and I connected to them both in different ways. Marina appealed my younger self and how I used to hope the boy across the street would notice me. Em is tough but vulnerable, which is my favorite type of heroine (you all should know this by now!). It's probably hard to imagine how or why these two girls find their lives intertwined but wow. Terrill amazingly weaves the details of her story between the two realities and the two point-of-views in such a way that you can't help but feel sucked in. I was ready for a fast-paced, action-packed plot but I was also moved and emotional by the end and I didn't expect that. (No) reservations: There may be a point when you'll ask yourself - where is this all going? But it comes together! Do I recommend? : I highly recommend this book. Especially when you hit the last twenty pages or so, you will stop everything you are doing until you reach the end. At least, that's how I felt! And there's going to be more! According to the author's site, this will be a duology and I'm very excited to see what happens next. Yay, I'm happy you enjoyed this one too Rachel! I agree that the best way to read this book is with no prior knowledge. It makes it waaay more exciting! The dual perspectives were also super cool! I've never seen that in a book ever! 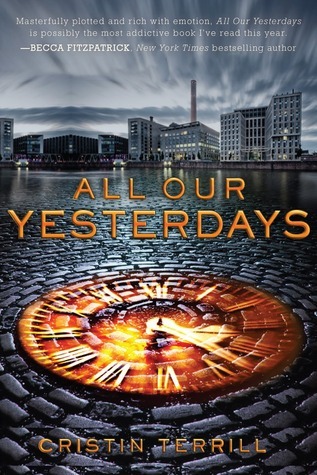 I'll be entirely honest: Before reading your review, I had very little intention of reading All Our Yesterdays, primarily because I'm a little burned out on this sort of novel. That said, I think you might have just changed my mind! I really appreciated that you were careful not to give anything away. I like going in relatively blind and it sounds as though this is one of those cases where it's particularly important. *Shakes fist* I don't know whether I should be angry that I've found yet another book to add to my perpetually-growing TBR list or thank you for inspiring me to take a chance on a novel I had planned to ignore ;) Just kidding! This was a lovely review, as always, Rachel. Hmm, this one sounds interesting, altho I'm not a fan of books that go nowhere, but I always finish books and since you said the ending was awesome, it might make up for it. I'll have to check it out. Great review! This book basically made my face look like this --> O_O <-- for most of it! It was quite a thrilling ride, and I had the hardest time setting it down when it was time to work/eat. But REALLY. I think the time travel elements are fantastic, and I really loved the characters, particularly Finn. YAY for awesome sci-fi books with time travel!